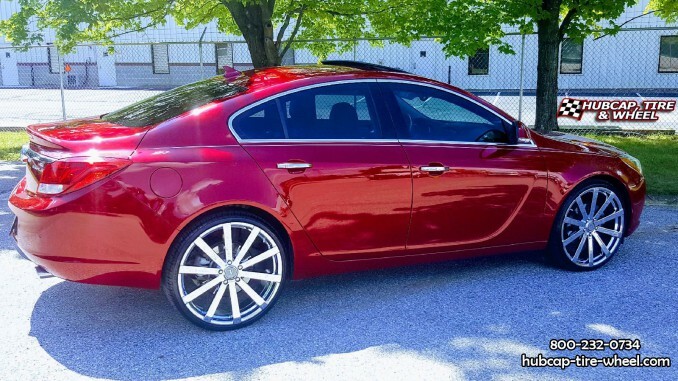 Here is our customer’s red 2014 Buick Regal with chrome 22 inch Velocity VW12 rims. The car came out great and looks extremely clean and sleek. The Velocity wheels really accent this red Buick well with the chrome trim around the windows and the chrome door handles. The Velocity VW12 wheels have that luxury type of look to them. They sort of look like stock wheels but will make someone take a double look and then realize they are custom wheels. That’s what we really like about the Velocity VW12 design. If you need help picking out these wheels for your vehicle, you can find our contact information below the image. Are you interested in these Velocity wheels or are you looking at any other wheels we have on our site? We can help you out to make sure you get the proper fitment for your vehicle. One of the biggest misunderstandings with custom aftermarket wheels is that people think they are universal fitting wheels because they have the same amount of lugs on the wheels compared to your vehicle. That is not the case at all. Universal wheels don’t really exist. Each vehicle has a specific bolt pattern and offset (which some of them are shared across makes and models). You need to make sure you get the correct bolt pattern and offset for your specific vehicle. That is why it is extremely important to talk with a wheel and tire expert prior to purchasing custom aftermarket wheels. We have wheel and tire experts ready to talk with you. Call us 800-232-0734 during our business hours or use the contact us page if you want to reach us after business hours. Our wheel and tire experts guarantee fitment for your vehicle or your money back.